Royal Air Maroc will open seven new routes over the next three months to Jun-2013 as the carrier takes delivery of new aircraft and brings others out of storage to cope with a surge in tourism demand. State-owned RAM has announced it will launch services from its Casablanca base to London Gatwick, Copenhagen, Stockholm, Las Palmas, Praia, Zurich and Turin. The carrier also launched a three times weekly service from Casablanca to Madrid in Oct-2012. The Moroccan flag carrier took delivery of two new Boeing 737-800s in Mar-2013, reportedly including its 50th 737 delivery, with another three to come in the second half of 2013 according to the CAPA Fleets database. At the same time the clock is ticking for the carrier to find a strategic airline partner able to help it cope with mounting pressure from LCCs. RAM will resume a three times weekly service between Casablanca and London Gatwick from 31-Mar-2013 using Boeing 737-800 aircraft. The airline plans to increase frequencies to 10 times weekly during the summer peak season. RAM last withdrew from the route in Nov-2011 as it underwent an extensive restructure in the face of an onslaught from LCC competition. RAM will offer 525 one-way seats per week, competing with Air Arabia Maroc to Gatwick. Air Arabia Maroc launched its three times weekly service with an A320 aircraft in Nov-2012, offering 486 weekly seats, according to Innovata. Air Arabia Maroc also operates twice daily between Tangier and London Gatwick, where it is the sole operator. RAM has a monopoly on the Casablanca-London Heathrow route, where it operates daily, after British Airways pulled off the route in Oct-2012, having replaced subsidiary bmi in May-2012. However, easyJet remains the biggest carrier by seats between the United Kingdom and Morocco, with its capacity dropping back to about 2,300 one-way seats per week in May-2013 compared to RAM’s increased capacity of 2,100 seats. Ryanair comes in third with about 1,500 weekly seats. RAM will also re-enter the Casablanca-Zurich route from 19-Apr-2013. RAM last operated the route in Oct-2011. The carrier will offer three weekly frequencies using Boeing 737-700 and faces no competitors on the route. RAM will fill a void in Morocco’s Scandinavian market with three weekly services each to Stockholm and Copenhagen from 31-Mar-2013. Both routes will be operated with Boeing 737-700 aircraft offering 354 one-way seats per week. Capacity to Copenhagen will be reduced to 327 weekly seats in Jun-2013 when the route is down-gauged to a 737-500, according to Innovata. At the same time capacity to Stockholm will increase to 468 seats per week resulting from an up-gauge to a 737-800 service on two of the three frequencies. RAM will compete with Binter Canarias on the Casablanca-Las Palmas route where the airline will operate 218 one-way seats per week from Apr-2013, compared to Binter’s 140 seats. The carrier will be the only operator on a new, twice weekly Praia route which will be served with a 737-500 from 07-Apr-2013. A planned Turin service will reportedly operate three times weekly using a Boeing 737-800 aircraft. In addition RAM will increase frequencies between Casablanca and Dakar from twice daily to 17 times weekly, effective from 10-Apr-2013. It is the sole operator on the route. RAM and Air Arabia Maroc both launched services between Tangier and Madrid in Oct-2012, competing against Ryanair and Iberia. RAM operates three times weekly with an ATR 72 aircraft, offering 142 one-way seats per week against Air Arabia Maroc’s twice weekly A320 operating 324 seats per week. 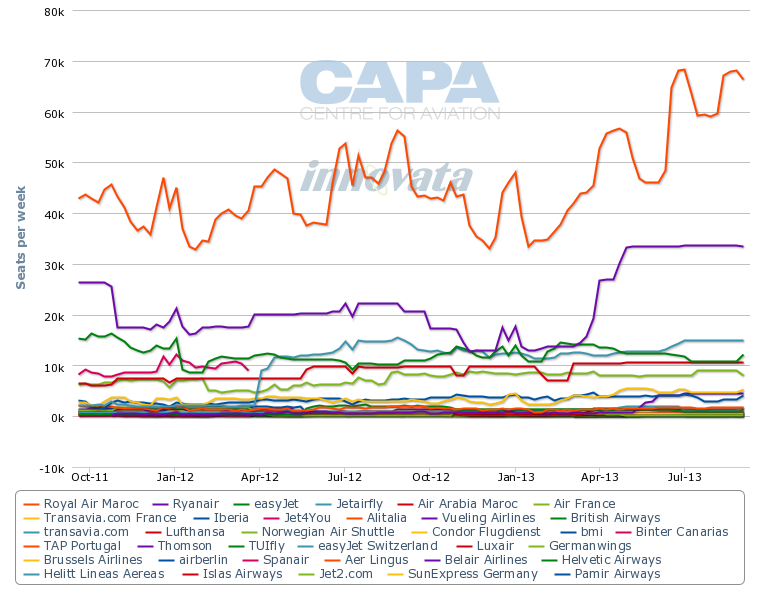 Ryanair will dominate the route when it increases capacity to over 1,300 seats in Apr-2013 from about 750 seats. Iberia operates about 1,000 seats per week on the route. The route additions, will take RAM’s network to a total of 77 destinations across Africa, Europe, the Middle East and North America. RAM is expected to take delivery of another three Boeing 737-800s in the second half of 2013, followed by two in 2014. The aircraft are configured with 175 seats, including 14 business class and 161 economy seats, according to the CAPA Fleets database. 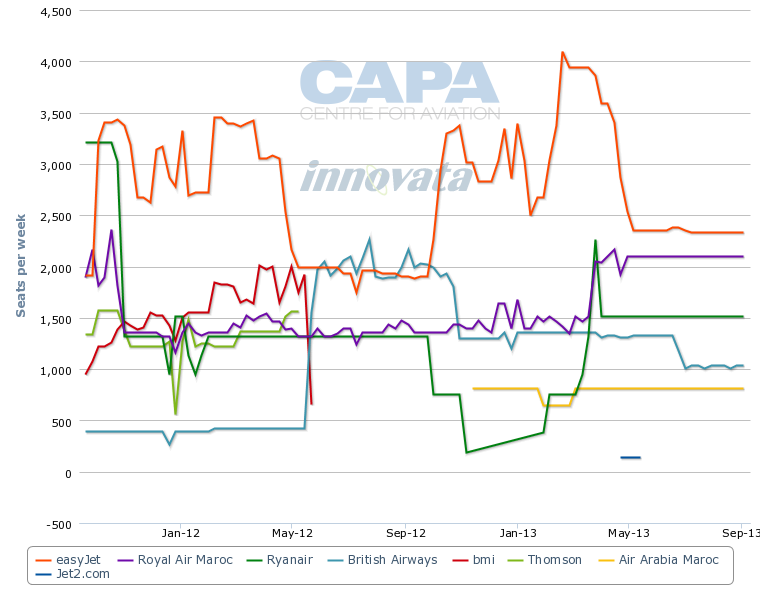 The carrier has four Boeing 787-8s on order with the first expected to be delivered in 2014. Oddly, two 787-8s have already rolled off the production line in RAM colours and are in Boeing storage. RAM was originally expecting to take delivery of the aircraft from 2012 and become the first North African carrier to operate the type. The 787-8s are expected to replace the 767-300ER on the daily Casablanca-New York route. RAM will also reactivate at least one of its four A321-200s, which have reportedly been in storage since spring 2012, to operate some peak summer season frequencies between Casablanca, Jeddah and Riyadh between 22-Jun-2013 and 08-Sep-2013. * Excludes new aircraft that are coming from leasing companies. Aircraft operated by subsidiaries/associates of the main carrier may be listed separately. Morocco’s open skies agreement with the EU, signed in 2006, has been hugely successful in attracting European LCCs to the country, bringing with them the tourists that will play a crucial role in an economic recovery that the country is cautiously looking towards in 2013. Western Europe accounts for 77% of Morocco’s international seats. France is the biggest market thanks to its strong colonial links, followed by Belgium. 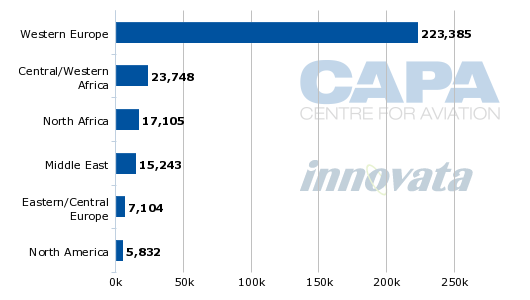 Both RAM and its main competitor Ryanair are the key drivers behind increasing total capacity by 27% from Western Europe to 170,000 one-way seats in Jul-2013 compared to Jul-2012. 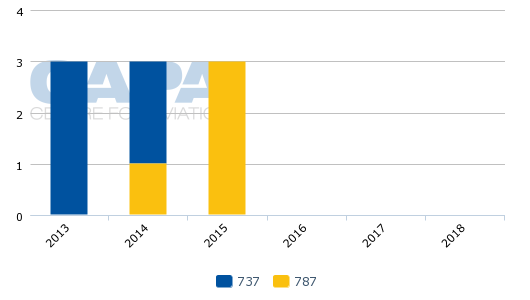 RAM, through its network and fleet additions will increase its European capacity to about 53,700 one-way seats in the peak Jul-2013 season, up 27% on a year earlier. Ryanair's Morocco expansion, including two new bases at Marrakech and Fes, will add 51% capacity over its 2012 offering to about 33,600 seats. Morocco’s third largest carrier, Jetairfly (formerly branded Jet4you) is also expanding its Moroccan network with three new routes to commence in 2013, The carrier will launch twice weekly between Paris Orly and Rabat from 01-Apr-2013, a weekly Toulon-Oujda service from 02-Jul-2013 and weekly Rotterdam-Tangier from 28-Jun-2013. Europe’s largest low-cost carrier Ryanair will establish two bases in Morocco in Apr-2013, by basing two aircraft at Marrakech and another at Fes. The carrier will also add Essaouria and Rabat to its Moroccan destinations, adding 17 new routes from the country for a total of 60 routes from eight airports, delivering an estimated 2.5 million passengers a year to the country. The USD210 million investment, announced in Jan-2013, was a stunning turnaround from just six months earlier when the Irish-based carrier decided to cut 34 frequencies, including several routes entirely, in protest at rising costs at the country’s airports. 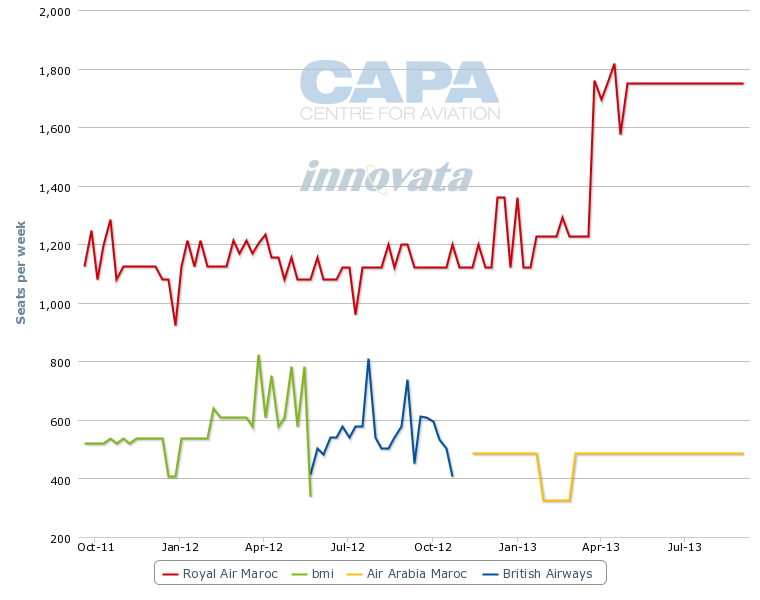 While Ryanair’s rethink is a significant boost for Morocco’s economy, it will also put more pressure on RAM, already struggling to cope with the LCC influx. The Moroccan government continues to look for a strategic partner after providing RAM with a USD193 million bailout. An additional USD900 million in public financing is available for the carrier through to 2016. The government initially considered selling a stake of up to 44% in RAM to a major Gulf carrier in order to increase international tourist connections to China, India and South America. But since Nov-2012 a slightly different approach, of a strategic partnership with an airline from the Gulf, Europe or the United States has been favoured - perhaps because the investment was not forthcoming. The carrier has been hit hard by the arrival of LCCs, including Ryanair and domestic competitor Air Arabia Maroc, on its routes after the Kingdom’s open skies agreement with the EU. This was subsequently compounded by the Arab Spring regional unrest and the general economic slowdown in Europe. But the other side of the liberalisation coin is that Moroccan airlines gain near-unlimited access to European points. This is not a totally illusory benefit, despite the might of the EU LCCs, although RAM will inevitably struggle to compete on equal terms. RAM’s additional network expansion announced in the first three months of 2013 is an encouraging sign that a turnaround is under way. However, the threat from LCC competition is not going away, and RAM will need to find a strong partner that can improve network diversification away from an unhealthy reliance on the European tourism markets.